← Native American Author Gyasi Ross to Speak on Make No Bones About It. Denny (TacH-Mi-acH-t3n) is an enrolled member of the Skokomish Indian Tribe, and a resident of the Skokomish Reservation. He has spent the past three decade’s advocating for Indian rights and Indian education and recently, helped develop the Northwest Native American Reading curriculum, which focuses on the Drum, the Canoe, and Hunting and Gathering. Also worked on the “Reading and the Native American Learner” research document. Am co-author of, “Reading First, Literacy and American Indian Students”, which is getting ready for publication and also finalizing a paper on a “Culture Based Professional Development Model” for educators. Denny received his Bachelor’s degree in Social Science and a Lifetime Secondary Teaching Credential from the California State University at Sacramento. Denny holds a Master’s degree in School Administration from the California State University at Humboldt. He has been the Indian Education Director for Washington State’s Office of the Superintendent of Public Instruction for the past ten years and work with all the 29 Tribes in Washington State. Before his appointment to the Indian Education Director’s position, he was the Upward Bound Director at the Evergreen State College for nearly seven years. Denny also served as President of the Northwest Association of Special Programs for three years, which represents the TRIO programs in, Washington, Oregon, Idaho and Alaska. From 1978 to 1992, he was an Indian commercial fisherman and substitute teacher. Denny has served on the Skokomish Tribal Council for the past seventeen years. He has held the positions of Chairman, Vice-Chairman, and General Council President. He also serves as the Co-chair of the Native Nations Institute, International Advisory council with the University of Arizona. Currently Denny is the Chair of the Native American Advisory Board at the University of Washington, and serves on the College Spark board, National Indian Education Association, and the Western region, college board. In 1998 he was selected to serve as a panelist for the achievement levels-setting pilot study for the 1998 civics national Assessment of Educational Progress (NAEP) and was selected as an intern for Rockefeller/American Association of Community and Junior Colleges Administrative Internship. 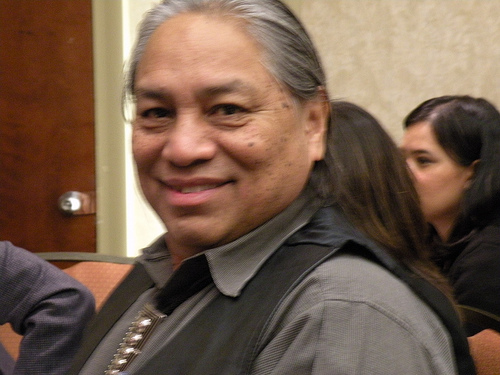 As an Indian educator Denny has presented many workshops and trainings in the area of Indian education and culturally responsive curriculum and professional development. His hobbies include photography, hiking and traveling. This entry was posted in Make No Bones Shows and tagged Honoring, Indigenous, KAOS 89.3 FM, Raven Redbone, Since Time Immemorial : Tribal Sovereignty Curriculum with Denny Hurtado. Bookmark the permalink.